Spray a 9x13-inch pan with cooking spray. Top with sprinkles. 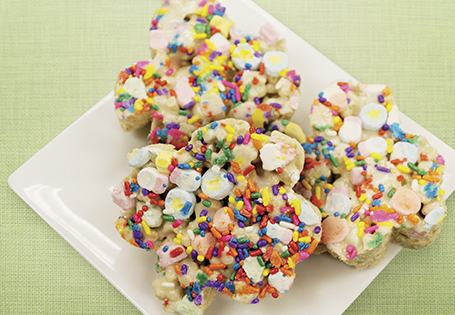 Separate 1 cup of marshmallows from cereal; spread marshmallows over layer of sprinkles. In a large pot, melt butter. Stir in miniature marshmallows until melted. Turn off heat and stir in cereal. Transfer to prepared pan. Press mixture evenly into pan and let rest 5 minutes. Cut into squares and invert onto a plate, serve. TIP: Use a cookie cutter for fun shapes.